Hostile Takeover is the second novel in the Rafe and Kama series, continuing the story that began in Calculated Risk. Rafe McTavish, security expert and new CEO at interplanetary mega-corp EcoMech, continues his pursuit of a ruthless blackmailer—with the help of his undercover ally, Kama Bhatia, computer hacker and corporate spy. When Rafe's arrival on EcoMech's frontier colony world ruins their adversary's plan for supremacy, events take a deadly turn. As tensions amongst the workers rise and unrest turns to violence, Rafe and Kama race to unmask a killer before Rafe and his family fall victims to a murderous hostile takeover. Hostile Takeover is available at Amazon, Barnes & Noble, Smashwords, Kobo, iTunes, and other ebook retailers. 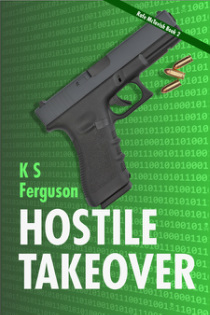 Read an excerpt from Hostile Takeover. Kamala Bhatia, we've been following recent events on Harvest, EcoMech's colony world. While you've been seen in a number of news vids with Mr. McTavish, EcoMech's new CEO, none of them agree about who you are. Can you clear up the confusion and tell us why you came to Harvest with him? Rafe: Kama doesn't like to talk about herself. She runs a computer school in Mumbai, although I confess I haven't been able to locate it. She's the step-daughter of Oasis Corp chairman, Varun Sharma. She does… contract work for Oasis. As you know, Oasis is the largest computer software company in the galaxy. Kama: I came to Harvest because the moorhk here thinks he's immortal. Someone had to watch his back. Rafe: Kama's not what you'd call a team player. She and I had a few communication issues. Kama (muttering): That's an understatement! Kama, what do you do when you aren't watching his back? Rafe: She advocates for improved corporate working conditions. Occasionally she flies pigs. Kama, why don't you tell them more about the pigs? Kama: It will allow the poor and oppressed to escape Earth's toxic environment—an environment created by corporate greed. The downtrodden will have the opportunity to throw off their corporate chains and make a fresh start in a better, healthier life. With McTavish at the helm of EcoMech, we can't fail. We've heard rumors that you two are engaged. Is that true? Kama (arms crossed): You've been talking to his loopy nephew, haven't you? Rafe (grinning): It's a little early for announcements, but I'd follow her anywhere.